If you’re looking to attract new patients online, you probably already know that everything starts with Google. Today, 1 in 20 Google searches is health related. And to put that in perspective, there are a whopping 3.5 Billion searches per day on Google. 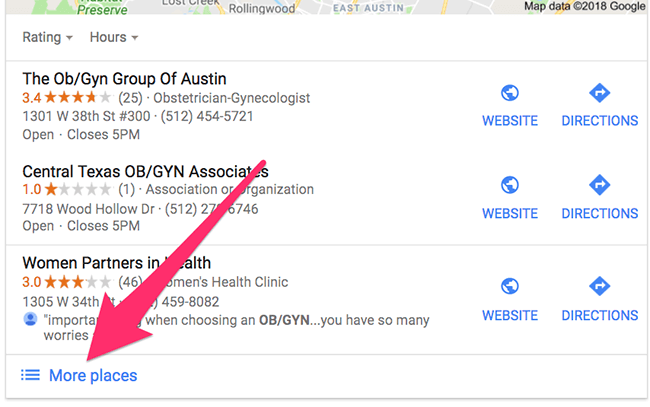 Optimizing the Google My Business listing for your medical practice will dramatically affect how you show up in local search results on Google. For instance, take a client of ours. Their Google My Business listing has been viewed 13,600 times just this quarter, and their traffic is still growing. And they’re not in a major city. Many people don’t even know what Google My Business is, but chances are that you will recognize it when you see it. This box on the right-hand sidebar is known as the Knowledge Panel, aptly named to sound regal and important because… it is! If you notice, the Knowledge Panel includes pictures, address, hours, phone number, and “Google reviews.” In this way, Google my Business is very similar to other third-party review sites such as Yelp and Healthgrades. 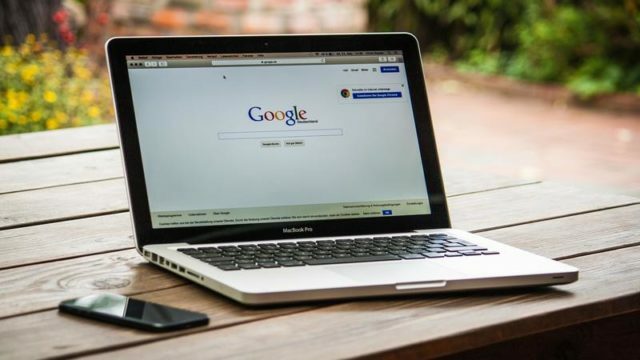 What differentiates Google My Business and makes it so important, however, is how (and, more so, when) the information is presented. Before potential patients have to go anywhere or click on any link, relevant information which they are looking for shows up. If you use your Google My Business profile efficiently, this could be a major improvement for your online presence. In addition to the Knowledge Panel, if you’ve been searching Google for a local business recently, you might have noticed something that’s called the Google 3 Pack. And if you’ve read my guide to medical marketing, you’ll know how big of a deal it is. 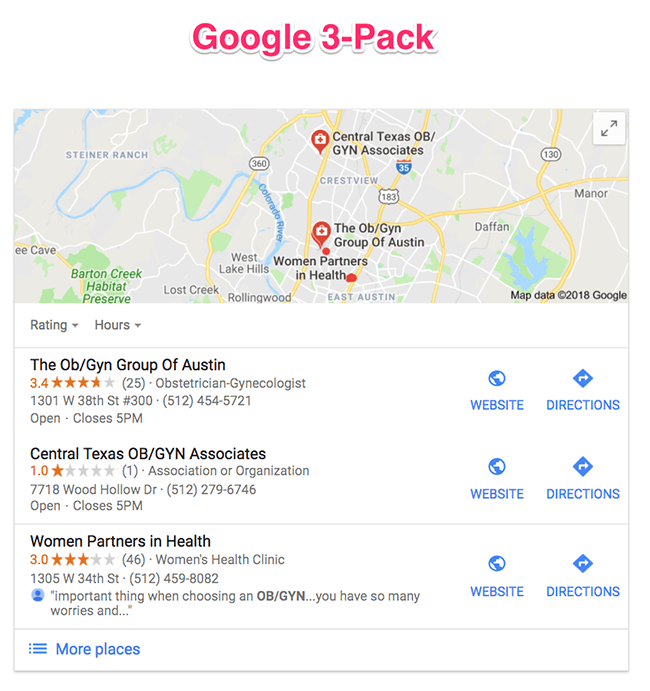 The Google 3-Pack displays three local business listings underneath a map with pins for each respective location of the businesses. Just as with the Knowledge Panel, the 3-Pack also displays your rating (out of 5 stars), phone number, hours, and links to your website and for directions to your office. This is where you want to show up because it’s where brick-and-mortar businesses generate the most clicks. Medical practices, in essence, are local businesses, relying on the surrounding community for work. When searching for dentists, surgeons, physicians, and the like, users are using terms like “near me” or “in Kansas City,” which triggers Google to pull up local listings like the 3-Pack. And even when users don’t include those keywords in the search bar, search engines will use your location to personally tailor your experience and, again, present the 3-Pack. Start by looking up your medical practice on Google. You’ll see the 3-Pack of local listings in your area. If you’re in a large city or crowded location, your practice might not show up in the top 3 listings. That’s OK – we’re going to fix that. If you don’t show up in the top 3 listings, click where it says “More locations” or “More Places”. Note: If you have multiple locations, you will have multiple Google My Business pages. That’s OK. You’ll just have to repeat these steps for each location to claim all of your pages. If you still can’t find it, let me know in the comment section below and I’ll take a look for you. Once you find your practice’s listing, if you see the “Own this business” button, this means that your page has not yet been claimed. If you see the button, click it. If you’ve already verified your practice’s listing, click here to skip this portion. After you click “Own this business”, you’ll have to verify that you actually own the business. There are a few ways to verify your involvement in the business. A lot of our clients have automated phone services that direct patient calls to different offices or departments through phone trees. Call verification doesn’t work if you have an automated system in place. For the most part, we verify our client’s locations by mail. You’ll get a postcard in the mail with your verification code, and it only takes a few days. Once you’ve claimed your business pages (it doesn’t matter if they’ve been verified yet), it’s time to check out your Google My Business Dashboard. Go to https://www.google.com/business/ and login to your account. On the left side, you’ll see a menu bar that has a ton of different pages. In the Info tab, you’ll be able to change and optimize your practice’s information such as your business name, address, phone number, and much more. 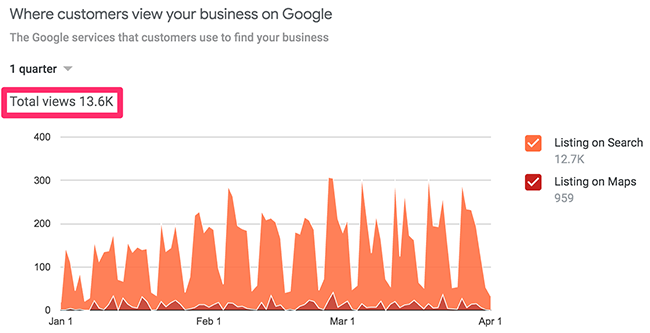 In the Insights tab, Google makes it easy for you to see how searchers are finding your Google My Business listing and even how they interact with it. For instance, you can determine how many phone calls or clicks to your website you’re getting. As medical marketers, these statistics help us track how our efforts are progressing. In the Reviews tab, you’re able to view and respond to reviews. Please keep in mind that responding to patients publicly can be considered a violation of their HIPAA rights. In the Photos tab, you can add, edit, or remove photos from your Google My Business listing, like the name suggests. 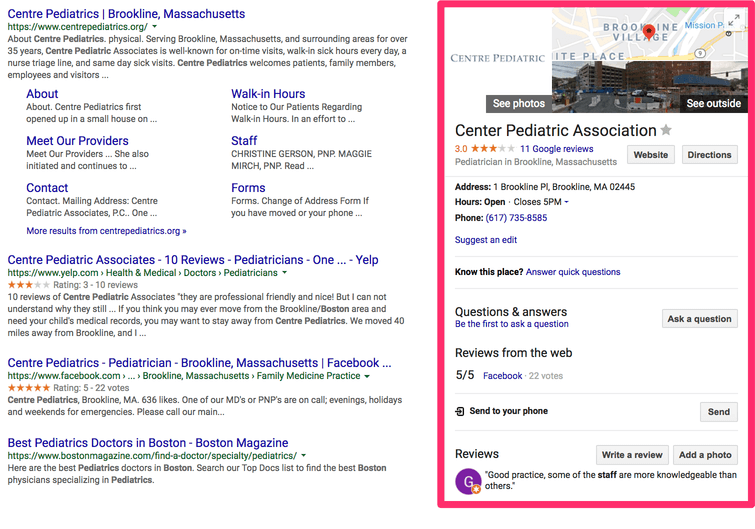 The most important thing you can do to improve your medical practice’s Google My Business listing is to make sure your Name, Address, and Phone Number (commonly referred to as NAP) are exactly the same as they appear on your website. This is extremely important for Local Search Engine Optimization. Even though small differences seem like they’re not a big deal, make sure everything is consistent. If you abbreviate “street” make sure you abbreviate it everywhere. If you spell “Suite” instead of “Ste”, do that everywhere. Having a constant NAP helps you rank your medical practice in Google and it adds legitimacy to your online presence. Patients want to see photos that give them an idea of the people behind your medical practice. 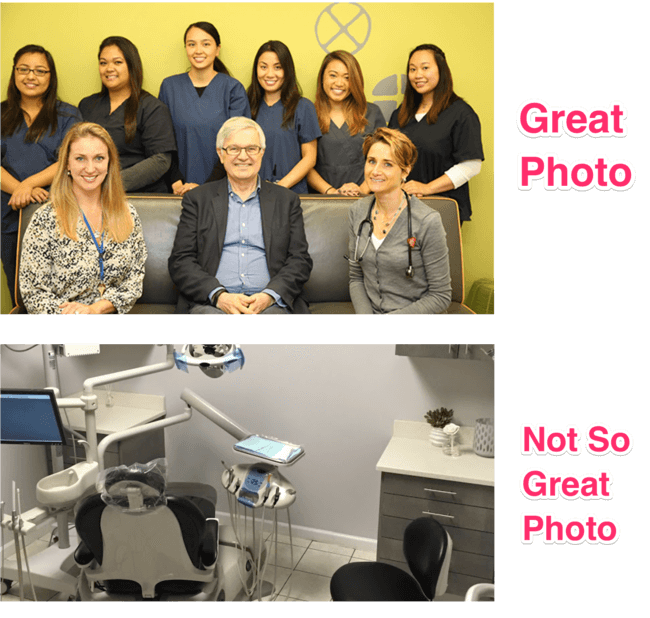 When optimizing Google My Business for doctors, we’ve found that heartwarming photos of staff and doctors works the best for our clients. You’ll want to also include photos of the office space and the building as well. Finally, If you don’t have tons of photos, that’s fine. Just put something. Anything is better than having nothing. 5. Get Your Unique Review Link. Reviews are the most important part of using Google My Business for doctors, especially since your reviews are featured so prominently and they appear in so many places throughout Google. Each Google My Business listing is given a unique link to share with customers (in your case, patients) so they’ll be able to more easily leave feedback for you. 1. Go to the Google PlaceID Lookup Tool. 2. Look up your medical practice and find your listing. 3. Copy your unique PlaceID. Anyone who clicks your unique review link will be sent to a review window where they’ll be able to easily leave a review on your Google My Business page. Once you’ve generated your review link, it’s time to start spreading it to people who will want to leave you some 5 star reviews. Also, sharing your best reviews wherever you can will help promote your online reputation. People will realize that you care about your online image, and they’ll feel inclined to take a minute to review your practice. 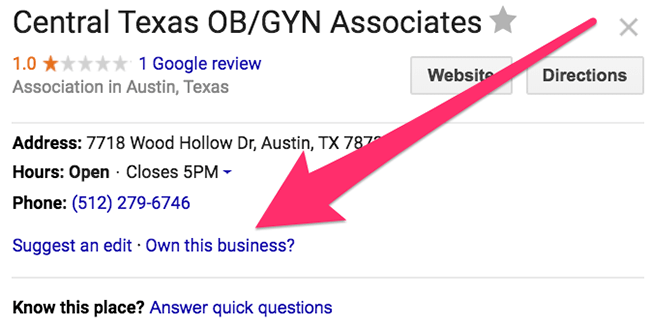 Conclusion: Why Use Google My Business For Doctors? We dipped into this a little bit already, but think about it. Google My Business takes up most of the results page. It includes not only your name, but your reviews, hours, phone number, and location. Often, users won’t need to look too much further because so much information is presented to them at the get-go. Google My Business for doctors can be a huge resource, but only when it’s used right. A lot of people just brush it aside, but frankly if you’re not using Google My Business to its potential, a competitor probably is. If you follow the steps outlined in this post, you’ll be well on your way to ranking locally in Google with a fully optimized Google My Business listing.